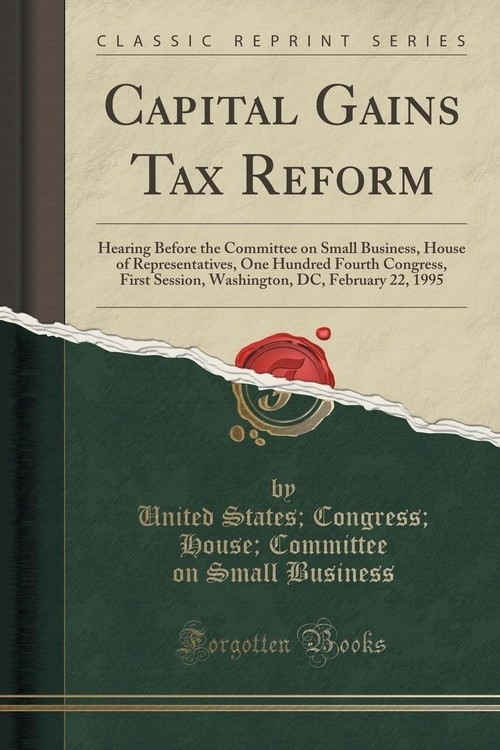 Excerpt from Capital Gains Tax Reform: Hearing Before the Committee on Small Business, House of Representatives, One Hundred Fourth Congress, First Session, Washington, DC, February 22, 1995<br><br>The committee met, pursuant to notice, at 1:30 p.m., in room 2359-A, Rayburn House Office Building, Hon. Jan Meyers (chairwoman of the committee) presiding.<br><br>Chairwoman Meyers. The committee will come to order.<br><br>Today, the committee will continue its examination of the capital gains tax reduction provisions contained in the Contract With America. As the Members will recall, on January 26, the committee heard from several small businesses and economic development specialists regarding the need for investment in small business and how that could be enhanced through some type of special tax treatment for capital gains. Our hearing today brings several economic experts before the committee to express their point of view on favorable tax treatment of capital gains as a means of stimulating economic activity and investment in small business.<br><br>I have asked the witnesses to comment on the capital gains tax reduction provisions in H.R. 9 and provide the committee with their assessment of whether or not reducing the capital gains tax rate would be a cost-effective way to spur investment in economic growth.<br><br>In addition, I have asked our expert witnesses to expound on whether or not an across-the-board cut in the capital gains tax would stimulate investment in all areas of small business growth or would a more targeted incentive be needed. Finally, I have asked the witnesses to testify as to their views of the capital gains tax reduction from the perspective of tax fairness.<br><br>I should point out that three of the seven witnesses testifying before the committee today are appearing at the request of the Ranking Minority Member, Mr. LaFalce. He submitted a list of several suggested witnesses for a hearing on the capital gains tax and those appearing today are the witnesses that accepted our invitation.<br><br>As I stated at our January hearing on this topic, I strongly support a reduction in the capital gains tax as a way to help stimulate investment in small business and as a step toward eliminating Federal tax policies which penalize savings and investment for the future.<br><br>I believe some of our witnesses will be providing data to the committee which supports this view. Others will present opposing information.<br><br>About the Publisher<br><br>Forgotten Books publishes hundreds of thousands of rare and classic books. Find more at www.forgottenbooks.com<br><br>This book is a reproduction of an important historical work. Forgotten Books uses state-of-the-art technology to digitally reconstruct the work, preserving the original format whilst repairing imperfections present in the aged copy. In rare cases, an imperfection in the original, such as a blemish or missing page, may be replicated in our edition. We do, however, repair the vast majority of imperfections successfully; any imperfections that remain are intentionally left to preserve the state of such historical works.